Mud cleaner is popular equipment for mud solids control and drilling fluids recycling. A mud cleaner is a combination of desander separator and / or desilter separators mounted over a solids control shale shaker. Compared with solids control shale shaker, mud cleaner will be mounted with fine mesh screener. Mud cleaner normally use shaker screen over API 100. Drilling fluids is fed to the inlet of the hydrocyclone (desander and/or desilter) to separate particles, and the underflow passes to the fine screen mesh, while the particles larger than screen opening size will be discarded and removed from the solids control mud system. In most drilling activities, a mud cleaner is installed in the solids control mud systems, with shale shakers, pumps, mixing system mud agitators, mud guns, etc… All the solids control equipment are mounted on mud tanks in the same drilling rig location, to work as a full functional system. For some small non-oil and gas drilling rigs, like water well drilling rigs, piling rigs, HDD drilling rigs, etc…they only have a very simple request on the mud treatment. They do not use mud tanks, as an instead, they use mud pit rather than mud tank system. In this case, the complex drilling fluids cycling system is not necessary. Operators can only use shale shaker or mud cleaner, and choose suitable feeding pump per their job site conditions. 1) A mud cleaner can be a combination of desander hydraucyclones mounted over a shale shaker for 2 stages separation. 2) A mud cleaner can be a combination of desilter hydraucyclones mounted over a shale shaker for 2 stages separation. 3) A mud cleaner can be a combination of desander hydraucyclones and desilter hydraucyclones mounted over a shale shaker for 3 stages separation. 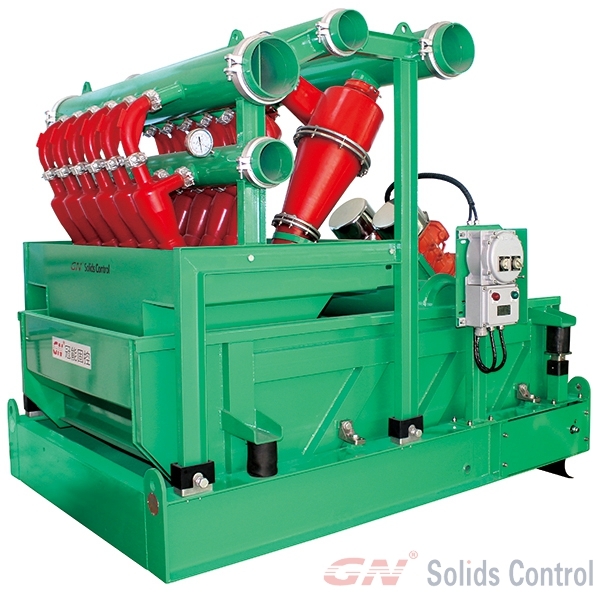 GN Solids Control designed mud cleaner can be used as a full set solids control shale shaker and a desander desilter unit, buy removing the hydraucyclone unit.